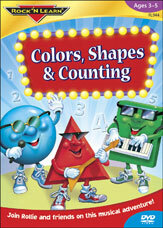 Colors, Shapes & Counting features the comical adventures of Rollie Roundman, Trollie Triangle, and Rockford Rectangle. These playful characters help preschoolers master basic skills and concepts for the kindergarten classroom through songs, laughter, and games. Children will be so captivated by the bright, action-packed animation (DVD) and stimulating soundtrack, they’ll want to watch and play along over and over again. Even gifted learners will be challenged by the advanced concepts we’ve included! Preschoolers review the basic colors and also learn maroon and turquoise. They discover polygons, trapezoids, the differences between a square and a rectangle, and more. They enjoy counting objects up to 20 by color, shape, or a combination of both… important preschool sorting skills. On Colors, Shapes & Counting DVD, the comical characters come to life. Preschoolers enjoy watching so much that many parents report this is their child’s favorite. Ages 3–5. Approx. 46 minutes.